Congratulations, praise the Lord, and wahoo! Congratulations, and God’s blessings on you both. Mazel tov! Congrats!!! I’m so happy for you both. You blogged on the way from the wedding to the reception? You are such a geek! I got home from shopping later than I’d hoped this afternoon, but managed to log in to the webast in time to catch the most important parts. Webcasted weddings…again, you are such a geek! So here’s to geeks everywhere…and to their lovely brides…and to the gracious God who unites them in matrimony. Cheers! Yay! Congrats. P.S. Who got you the Pizza Baking Kit from Bed, Bath, and Beyond? That looks like an awesome gift. How wonderful! Congratulations, you newlyweds! Congratulations you two! We wish you much happiness. Take care of each other. Congratulations! You two look very happy. May God bless your union with years of happiness and love. Oh wow, congratulations!!! :) Best wishes! 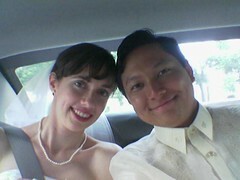 Congrats, Paulo & Amy! Best wishes to you both! Congrats on the wedding! There are plenty of new adventures to be blogged! Hope I get to meet Amy in person someday. Congrats, BP. I was in Nebraska for a wedding at the same time you were doing your thing. It was a wedtastic day!